Framework is a collection of 34 of Tom's best card effects, created from 1978 to 2011. Think of this a an excellent 'best of' collection of Tom's work. 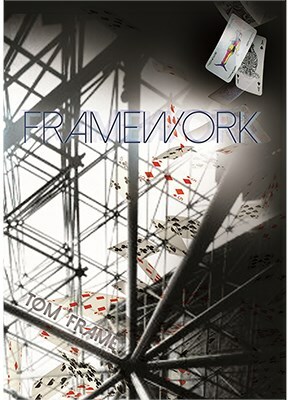 If you have read Hold 'Em Magic, you will know that Tom Frame has some excellent material. His latest offering continues this trend. With a foreword by Jon Racherbaumer, the book gets off to a strong start which continues throughout. The effects are ideal for the intermediate card worker but there is plenty of material that will also interest advanced card technicians. A feature that we love is that each effect includes a scripted presentation, which, Tom believes is vital to the impact of his effects. Hardcover with full color dust jacket. 7" x 10". 294 pages. 238 photographs. towards smart, practical construction in his methods. onslaught.” [...] Almost every trick is hysterical in both its teaching and its patter.